Nestled comfortably in the hills of Kauai's South Side, in an upscale area, secluded and away from the salt air and noise of resorts. This is a 1500 sq. ft. luxurious Tropical Hawaiian custom home. 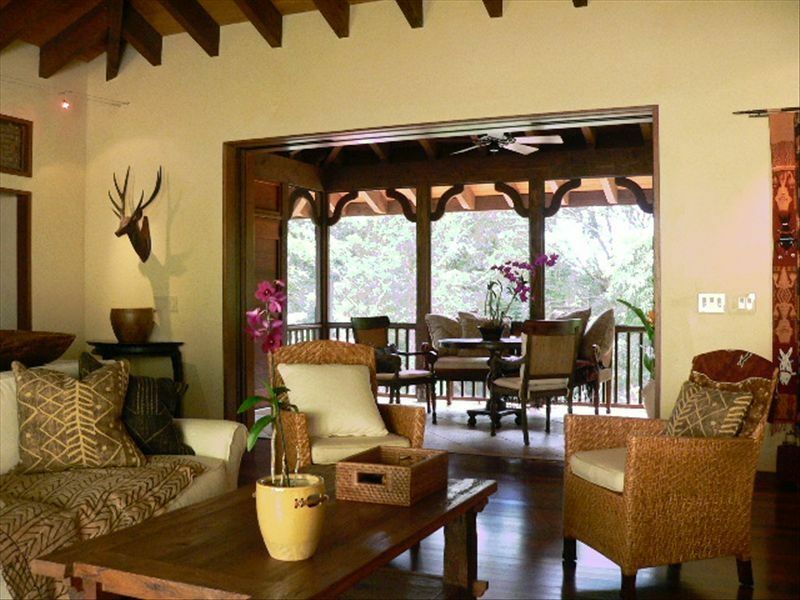 This house is perfect for a romantic getaway for two or roomy accommodations for two couples. The fresh tradewinds blow gentle breezes through this amazing house, filled with antiques and custom furniture. It is equipped with “top of the line” everything from the dishes, linens, pillows and bed to the doors and floors. There is a gentleness to this Hawaiian house that gives the feeling of peace. Whether lounging on the screened lanai or soaking in the outdoor hot tub, it's luxury at its best. There are two master suites each with queen beds and huge walk in showers. The suites are privately located on either ends of the house. This home is appointed with real tropical hardwood floors throughout, Gourmet kitchen, and an unbelievable attention to detail. A personal Chef is available for romantic dinners at home or if you would like, a massage done in the privacy of your own home away from home. This is the kind of home that is so comfortable you won’t want to leave, but when you do it's just 10 minutes to lovely Koloa Town, the oldest plantation town on the island with quaint shops, restaurants and local grinds (food), 15 minutes to Poipu’s beautiful beaches, surfing, golf and fabulous restaurants and 15 minutes from Port Allen where you can embark on an adventure to the breathtaking Napali Coast or a romantic sunset cruise. Bob and I married 30 years ago. We were and are still in business together which we can conduct through the Internet. The first time we came to Kauai in 1999- we fell in love with it. The beauty of the land and the aloha of its people, for us it is paradise. We decided on that first trip that we would live here . It has been a good decision. After 16 years we are still in love with Kauai. A love we enjoy sharing with our guest. We built this house from the ground up. Having been home builders and designers for some years, we had great fun designing it just the way we liked. This house was not originally built as a guest house, but as a home for Bob's father. No cost was spared in the building or furnishing of this house. It is obvious when you see it. Bob's father found a retirement living situation that he loves and now only comes once a year. Now we have the fun of sharing this beautiful house with our guest. Its very private and romantic - a good percentage of our guest are on their honeymoon. This house feels like its in the middle of nowhere, but its only minutes to almost all of what Kauai has to offer. Its located down a country lane then turn on to a short cul-de-sac where there is very little traffic. Its such a safe quiet area . The hot tub is located outside in your own private court yard. All the windows look out to lush foliage. Since this house is located 800 ft above sea level, the breezes are cool - actually the temp. is perfect, never a need for A/C or Heat. You can leave the windows open year round and feel the fresh trades winds. use of Owners private gym. comfortable setting for 6, use of owners private gym located on property. Beautiful hand made dishes. Fits the Hawaiian/Indonesian decor. Top of the line new appliances - beautiful dishes. Nice pots and pans. Everything needed for an elegant dinner. dinning is on the beautiful screened lanai. Beach chairs, Cooler, and Boogie boards are provided. This house is very dark inside and the lack of acceptable lighting only makes it worse. Wall switches are in really odd places and the bulbs used are such low wattage that you'd be better off using a candle. You have to back out of the driveway down a hill for about 200 feet to get your vehicle out, awkward. There is no oven. Cleaning supplies were lacking however, the owner thought that the stove was too dirty when we left. The stove was dirty when we arrived and my wife could only find Windex to try and clean it. We were lectured about the proper care of wood floors. We have wood floors in our home. The floors are a very dark wood, not a smart choice for a vacation rental. The crushed lava rock used for landscaping around the house attaches to your shoes and feet and consistently finds a way into the house. All I did for 10 days was pick up rocks out of the house. We were told that we should have vacuumed them 3 times in a row before we left to get rid of sand??? The vacuum cleaners on site are pretty much worthless and would barely pick up a hair much less sand or lava rocks. But I did find a mummified frog during one of the vacuum attempts. I guess the house wasn't as spotless as she thought. There was no propane for the grill. Hot water takes about 5 minutes to reach the shower. The smoke detector chirped through out the night. The resident chicken likes to start crowing around 3 o'clock in the morning so bring ear plugs or you won't get any sleep. There are rather large spiders with webs in the house. Bob was very gracious and personable. The internet and cable worked well. We were disappointed however in the house vs the cost. This was our 2nd time staying at this house when visiting Kauai. We have visited the island 5 times and generally stay one week on the south shore and then move up to the north shore for a few weeks so we have experienced many rental homes. This has been the only house we have come back to a 2nd time. Why? Location and quality of the rental. The house is located up a hill in a lush forested residential area in what we think is THE prime location for visiting places across the south shore. It is not in the major tourist area but it is just a 15 minute drive there, if you want to go there. It is 5 minutes to old Koloa town, 20 minutes to Wailua, close to Hanapepe, and an easy drive to Lihue for the farmers market and Costco....etc. The home it self is lovely and serene. It is well decorated with 2 master suites. It is clean and well maintained. I am very picky and this home met my personal requirements! The owners live up the hill in another home and they are gracious and friendly. They dont intrude in any way and you probably will not hear from or see them at all but they are there is something comes up. They did happen to invite us to a holiday party at their home on the day we arrived which was quite an unexpected and lovely gesture and a good time! Anyway, with that all said, I highly recommend this home but PLEASE KEEP IT NICE if you stay there...... as I am likely to be back. We had an amazing time staying here. The home was beautiful, secluded in a perfect location on the island surrounded by tropical vegetation. We enjoyed having breakfasts on the lanai, cool breezes at night, and dips in the hot hub. We loved being able to borrow beach chairs and boogie boards to go to the beach and really appreciated the outdoor shower to wash off salt and sand from days at the beach. It's a challenge to put into words just how tranquil this home is, and how it made our honeymoon in Kauai truly wonderful. Clean and very inviting. Bob and Fay were a delight to meet and are excellent hosts. Would come again. We enjoyed our stay very much. The condo was central to our purposes and we especially liked the well equipped kitchen. The sunset from the lanai was wonderful. Located in a beautiful rural area with parcels of land being at least 1 acre so lots of space between homes. There is little traffic as the location is up a narrow country lane and off a cul-de-sac. Great for quiet strolls or running. This house is not suitable for children under the age of 9. There is an additional fee for foreign visitors using credit cards that are not international.